Graduate Travel | J. Taylor at SHAV Conference!!! J. Taylor at SHAV Conference!!! Hello Longwood Students, Faculty, and Staff!! My name is Jalyn Destene Taylor and I am a first year Graduate student in the speech language pathology program. I am originally from Philadelphia, PA and I have found that I love the small town of Farmville, VA and the Longwood University community. I attended the 60th Annual Speech-Language-Hearing Association of Virginia (SHAV) Conference from March 22nd to March 24th, 2018 in Williamsburg, VA. I learned a lot during the seminars that I attended during the conference. I look forward to using my new knowledge about pediatric dysphagia and feeding therapy, collaborating with other professionals when it comes to working in the schools, and integrating tele-practice into my future work as a speech language pathologist. 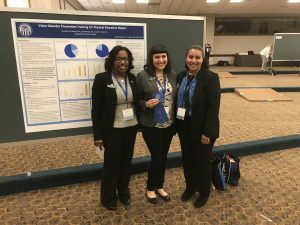 Another thing that I did during SHAV was a poster presentation with my parters, Seraphina Chabinec and Leah Horton about Vocal Hygiene pertaining to Physical Education Majors. To our delight, we won the first place prize out of 22 posters during the convention!!! Above are some pictures of me and my partners from the convention with our stunning poster. It was such a wonderful experience and I would love to attend next year! 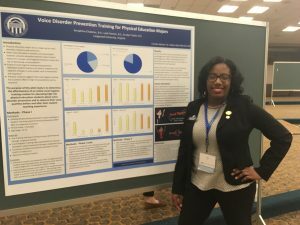 This entry was posted by Jalyn Taylor on April 16, 2018 at 10:36 am, and is filed under 2017-2018, Communication Sciences & Disorders. Follow any responses to this post through RSS 2.0. Both comments and pings are currently closed.